Steady inflow through a non-axisymmetric stenotic model at Re = 500-1000 for Newtonian and shear-thinning non-Newtonian rheologies was studied numerically to investigate the experimental evidence of stabilizing effect of shear-thinning fluids. A minimally-dissipative and energy-preserving finite-element based code was used, and results were verified against a higher-order spectral element code. Below a critical Reynolds number (Recrit), both rheology models showed non-stationary and intermittent flow in time, with successive phases of laminar and turbulent regions that were quasi-periodic with long observation times. Using the conventional definition of Reynolds number based on high-shear viscosity, transition was delayed for the shear-thinning model, with Recrit of 760 vs. 700 for the Newtonian rheology, a delay broadly consistent with previous reports. However, using domain-averaged viscosity aposteriori, the Recrit for the shear-thinning model dropped to 710, closer to the Newtonian value. The transition process and the vortical structures for both rheologies were similar, albeit with some differences in the turbulent kinetic energy and evolution of non-stationary perturbations near the transition point. 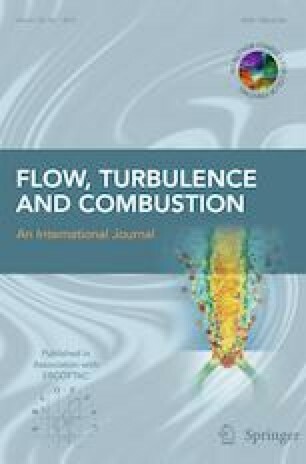 This suggests that previously-reported delays in transition to turbulence for blood vs. Newtonian fluids may be due to rheological factors other than shear-thinning, such as viscoelasticity. Our study also further highlights the challenges of defining non-Newtonian Reynolds numbers for flows in non-trivial geometries. The online version of this article ( https://doi.org/10.1007/s10494-018-9905-7) contains supplementary material, which is available to authorized users. The authors thank the reviewers for their helpful comments and suggestions, especially regarding the re-interpretation of our findings in light of Reynolds number definitions. Computations were performed on the GPC supercomputer at the SciNet  HPC Consortium. SciNet is funded by: the Canada Foundation for Innovation under the auspices of Compute Canada; the Government of Ontario; Ontario Research Fund - Research Excellence; and the University of Toronto. The study was supported by The Research Council of Norway through a Centres of Excellence grant to the Center for Biomedical Computing at Simula Research Laboratory, project number 179578 and as part of the Centre for Cardiological Innovation, also funded by The Research Council of Norway. MOK acknowledges funding support from Barbara and Frank Millgan Fellowship, Weber and Mariano Scholarship, Mary Gertrude I’ Anson Scholarship, Frank Howard Fellowships, and Simula Research Laboratory Fellowship. DAS acknowledges grant (G-13-0001830) and salary (MC7455) support from Heart & Stroke Foundation.